The Dining Room is a centerpiece of the home due to its exquisite design and central location in the home. It is easily accessed from the kitchen and foyer and is connected to the Living Room through a large accessway. 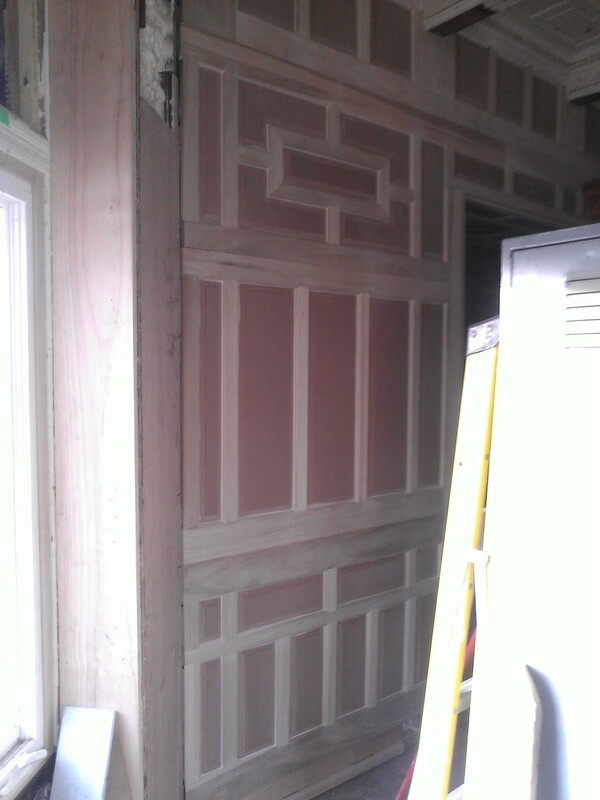 Chris Holtman’s carpenters recreated its paneling, again taking a tip from the one wall left with the original pattern. 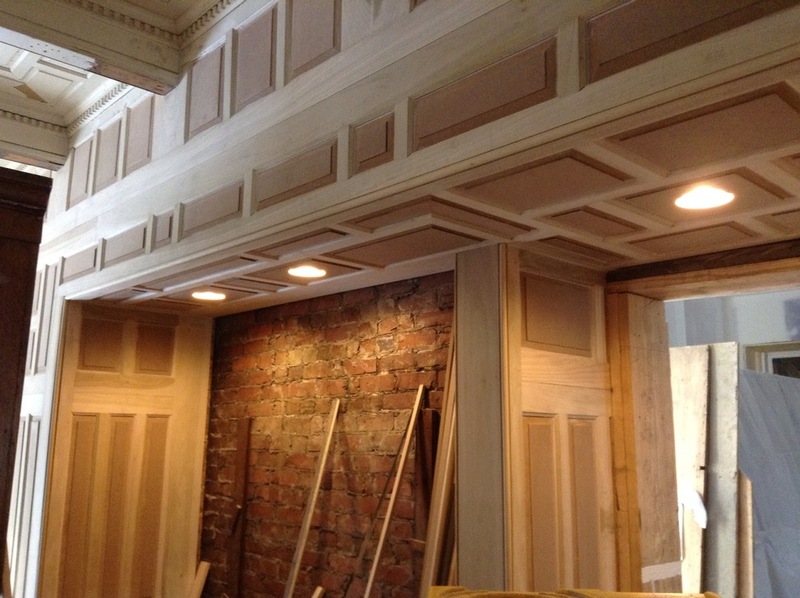 They also fashioned a dramatic coffered ceiling. Ben Walters... The only room in the home that we could have simply painted the walls was the dining room. 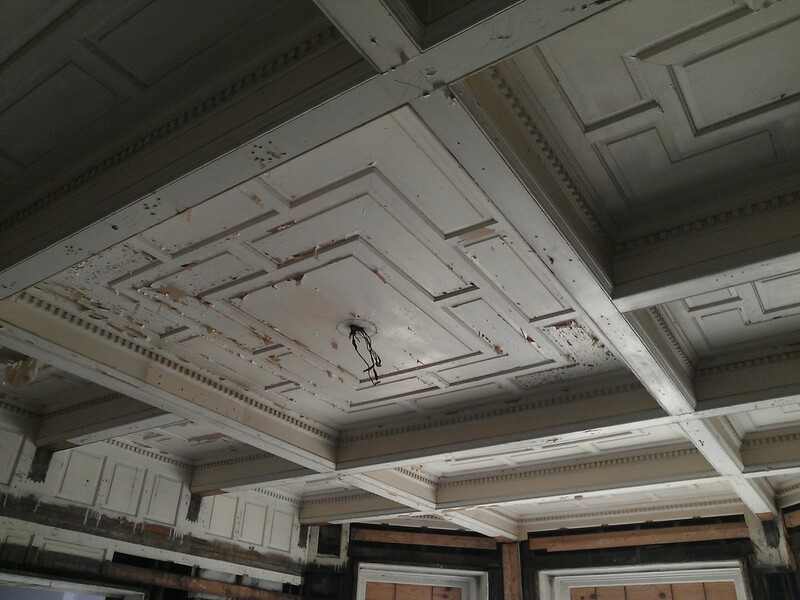 However, we discovered that underneath the "perfect" drywall, was a paneled, coffered ceiling. 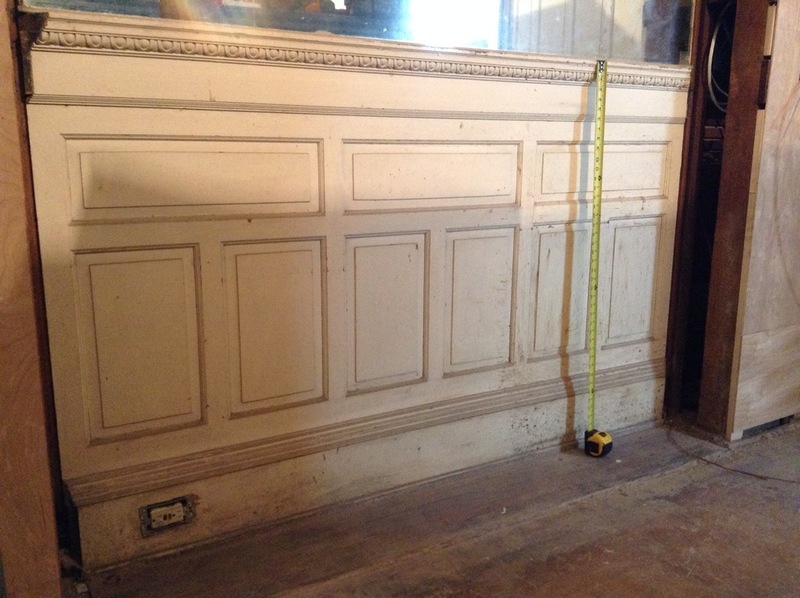 When we removed the dry wall on the walls, we discovered that one wall was also paneled to the floor. The rest of the paneling had been ripped out at some point previously. Chris milled over 600 individual panels that slid together. He trimmed and completed the entire room to include surrounding an arched mirror that was original and on one wall. He also re-framed the three stained glass windows in the bay of this room. To say it is spectacular, does not begin to describe this work. This was another hidden gem. Covered over by drywall, the owners were unaware of this mirrored alcove until a former resident, Victoria Cox, who lived in the home as a child in the early 1900's visited the house while under restoration and mentioned it. She also pointed out many details about the house that helped Ben and Kristen Walters restore it to its original state where possible. Ms. Cox was a member of the Nielen family who lived in the house for 68 years after purchasing it from the Rhodes family just five years after it was finished. The Walters also used historical photographs of the house provided by Nielen family members and invited them to tour the house when it was completed. Unfortunately, Ben said, the elderly Cox died the first night the family slept in the house and never saw how well everything turned out. Two original stained glass windows in a south-facing bay were restored by the late David Danehour, and glass artisan Gillian Thompson replicated a third that looks as old as the originals.